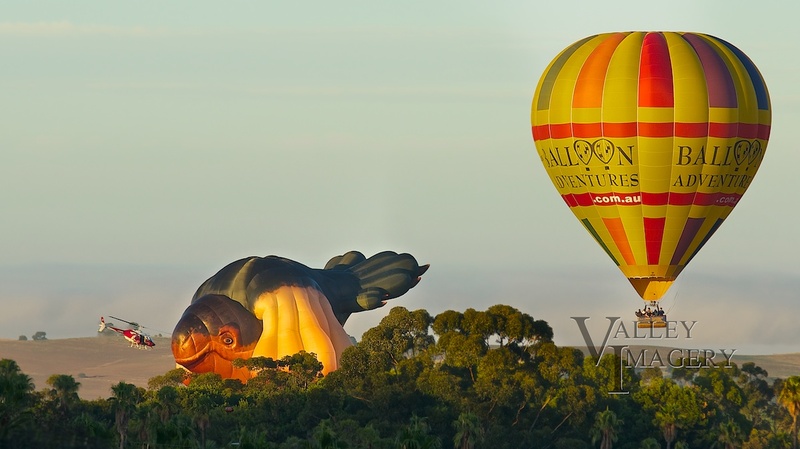 As part of the Adelaide Art gallery “Dark Heart” exhibition the controversial Skywhale Hot Air Ballon took to the skies in the Barossa. An early start was required and after some early confusion as to where the ballon was launching from (I was late) I made it to the launch site. A small crowd of onlookers, Photographers and Ballonists gathered in a paddock to watch it inflate and take to the skies. It was a good opportunity to photograph a unique piece of art and the weather was great for all. I took a few photo’s of it as it was being inflated and then followed it as it sailed over Seppeltsfield and then landed before getting to Tanunda. I would defiantly describe the balloon as unique and perfectly suited to stir discussion, I hope the designer (Patricia Piccinini) was trying to achieve this as almost everyone has an opinion on it.